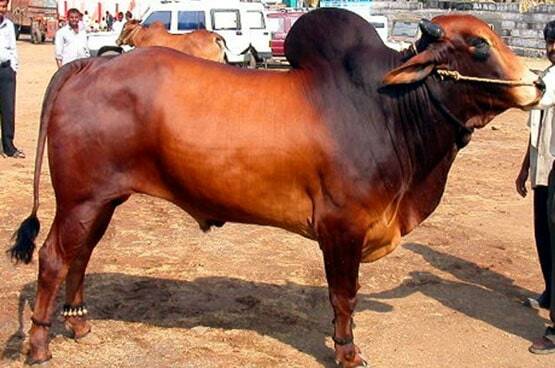 Red Kandhari is the prominent cattle breed of Marathwada region in Maharashtra. Although the cows are low milk producers but the breeding efficiency is high. It is said that this breed attracted attention of royal dynasty of King Soma Devraya as far back as 4th Century A.D. Raja Somdeorai was son of Raja Kanhar who ruled over Kandahar, a town in Nanded district. The name Red Kandhari appears to be the corrupted name for ‘Raja Kanhar’. Since the animals have predominant red color hence the natural name ‘Red Kandhari’. The breed could have been named by Raja Somdeorai in memory of his father as ‘Red Kanhari’ but with passage of time the misnomer ‘Red Kandhari’ became more common. The breeding tract of Red Kandhari cattle comprises of districts of Nanded, Parbhani, Hingoli and Beed districts of Maharashtra. The animals in purest form is found in Kandahar, Mukhed, Nanded and Biloli Tahsils of Nanded district and some of other districts like Ahamadpur, Hingoli, Latur, and Parbhani tehsil in Marathwada region. The animals best suited for semi-arid hot and dry climate of these areas. Male s are specially reared for draught purpose. The males are medium in size, strong, compact and good looking. Body colour is red to almost dark brown. Red Kandhari is a medium sized strong and robust animal. The body is compact squarely built but not massive. Bull as a rule is shade darker than cows. Forehead is broad between eyes and is slightly bulging; ears are long dropping sidewise and rounded tips. Eyes are shining with black colored rounded eyes. The breed has been well studies at the College of Veterinary and Animal Sciences which maintains a good herd for supplying quality bulls to farmers. On average the body length is 109 cm, height at wither 128 cm, heart girth 150 cm, face length 46 cm, ear length 24 cm, long horn 16 cm and tail up to the switch 75 cm. The corresponding figures for bullocks were found to be 118, 131, 109, 48, 24, 21 and 85 cm, respectively. Herd size ranges from 2 to 5 animals. At birth the calf weigh small (19-22 kg) compared to other breeds hence the cows enjoy ease at birth. The cows produce 1.5 – 2 kg milk per day. Average fat content in milk is 4.57± 0.03% and SNF content 8.62 ± 0.01%. The breed lactation yield average has been found to range between 400 – 600 kg. The lactation length is 230-270 days whereas dry period is average 130-190 days. The age at first calving, gestation period, service period and calving interval ranged from 30-45 months, 272-290 days, 120-170 days and 360-700 days, respectively. Bullocks are preferred due to better drafting ability even though smaller in size. Red Kandhari breed supplies bullock power to northern part of Marathwada. 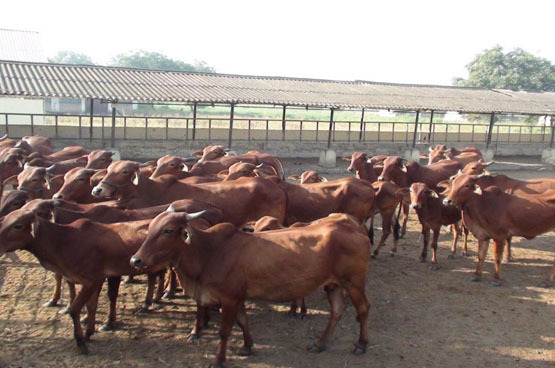 In markets like Parbhani and Puna in Parbhani district, and Loha Kundalwadi and Naigaon in Nanded district facilities are available for sale and purchase of these animals. In the last two named markets, bulls and cows of pure breed are available for breeding purpose.